The scar is a natural process of healing after an injury. There are different types of scars such as contracture scars, hypertrophic scars, acne scars, and keloid scars. The scar is treated with the help of over the counter drugs, injections, and surgical removal. The global scar treatment market is predicted to grow at 11.9% CAGR during the forecast period with the market size reaching USD 37.6 billion by 2024. Different types of products such as surface, laser, topical, and injectable are majorly contributing to the scar treatment market size. The market has witnessed significant demand for topical over the last few years due to cost effectiveness, easy application, easy availability, fewer side-effects, and to greater acceptance of creams and gels for healing scars, such as burns, acne, and surgical marks. Based on the product, the scar treatment market is categorized into surface, laser, topical, and injectable of which topical hold the largest share in the scar treatment market, globally, and led to the fastest growth of the topical segment during the historical period, which is also predicted to continue during the forecast period owing to greater acceptance of creams and gels for healing scars, such as burns, acne, and surgical marks, easy availability, cost-effectiveness, fewer side-effects, and easy application. The surface segment is further subdivided into chemical peeling, cryosurgery, and dermabrasion. Among the all the surfaces, dermabrasion segment accounted the largest share and is expected to grow at the fastest rate in the market. Moreover, the laser segment is further subdivided into the CO2 laser, pulsed-dye laser, Erbium: YAG laser, and others. Among all the lasers, the CO2 laser segment accounted the largest share in the market. In addition, the topical segment is further subdivided into oil, gel, cream, gel sheet, and others. Among the topical, the cream category holds the largest share in the market. The gel sheet segment is expected to grow at the fastest rate in the market. The injectable segment is further subdivided into the dermal filler and steroid injection. Among both injectables, the derma filler segment accounted the larger share and is expected to grow at a faster rate in the market during the forecast period. On the basis of the type of scar, the scar treatment market is segmented into acne scar, contracture scar, post-surgical scar, stretch mark, and keloid and hypertrophic scar. Of all, the keloid and hypertrophic scar category are predicted to witness the highest growth during the forecast period due to an escalating number of burn cases. Moreover, of all type of scar, post-surgical scar category accounted the largest share in the scar treatment market due to a mounting number of surgeries and an increasing number of road accidents. The mounting occurrence of skin diseases such as vitiligo, psoriasis, eczema, and photoaging of skin, technological advancement in products, escalating appearance consciousness among consumers, mounting number of surgical procedures, and intensifying disposable income are the key factors leading to the growth in the scar treatment market, globally. For instance, according to the American Academy of Dermatology, in the U.S., annually approximately 50 million Americans are suffering from acne. Owing to the mounting disposable income, the upsurge in personal care spending has resulted, which further increases the demand for treatment of scars. Some of the other key factors driving the growth of the industry are mounting awareness about the treatment of scars, mounting healthcare expenditure, an increasing number of road accidents, and escalating demand for organic products for the treatment of scars. Key factors hindering the growth of the scar treatment market are the side effects of scare treatment products and therapies, and the high cost associated with scare treatment products. Geographically, North America is the largest scar treatment market as in the region the occurrence of skin disease is increasing. 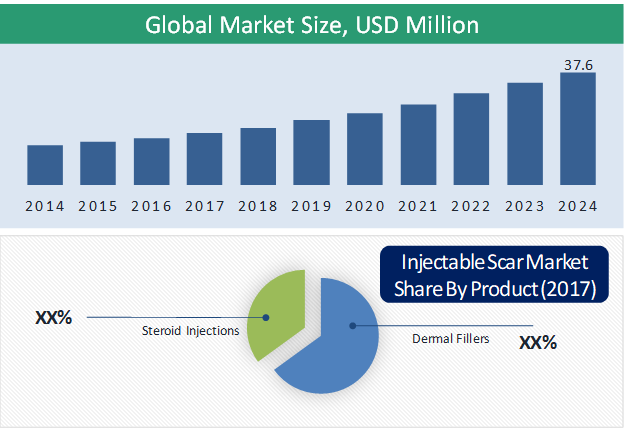 In addition, mounting disposable income, a large number of players in the U.S. are focusing on R&D to introduce new products, and technological advancement in treatment products are also fueling the growth of the North American scar treatment market. 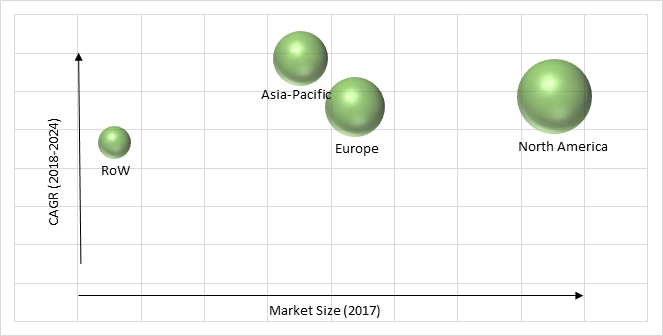 Asia-Pacific is observed to witness significant growth in the scar treatment market during the forecast period, as the region comprises a large population. Moreover, mounting disposable income, mounting healthcare expenditure, improving healthcare infrastructure, expanding awareness regarding the treatment of scars, and escalating skin related problems are also facilitating the significant growth of Asia-Pacific scar treatment industry. Market players in the scar treatment industry are investing capital to develop technologically advanced systems. In April 2017, Sonoma Pharmaceuticals, Inc. received regulatory approvals for Epicyn Scar Hydrogel from the United Arab Emirates Ministry of Health & Prevention, for the management of scars. Hologic Inc., Sonoma Pharmaceuticals Inc., Avita Medical Limited, Smith & Nephew Plc, Scarguard Labs LLC, Mölnlycke Health Care AB., Bausch Health, Merz Pharma GmbH & Co. KGaA, and Johnson & Johnson are some of the key players offering solutions for scar treatment. Note: Financial insight are subject to availability of information in secondary domain.